As I mentioned in my post for Sweet Potato & Marshmallow Bars, I really love sweet potatoes, but I think that sweet potato dishes often fall into the sweet/dessert sector. Not these. These twice-baked sweet potatoes have just a hint of sweetness, but they are most definitely savory. And that's definitely a good thing - sage, brown butter, and gruyere. mmmmm. I know you probably already have your Thanksgiving menu planned out, but if you are still looking for a side dish to replace sweet potato casserole, this would be a great choice. Especially if you are planning dinner for just a few people - you don't have to make a huge casserole, and everyone gets their own individual portion. These potatoes were kind of an experiment, but they were so delicious. I made these for lunch one day thinking that I'd eat one half potato that day, and save the other one for the next day. Well, I ended up eating both. Oink oink! I loved the combination of the crunchy breadcrumb topping with the creamy potatoes, the savory sage and breadcrumbs mixed with the sweetness of the filling, and the richness from the Gruyere. Everything is better with Gruyere, right? This is a great side dish to pretty much any meat, but it is great on it's own as well. Served with a side salad, this would make a wonderful light fall or winter dinner. Preheat the oven to 400 degrees. Pierce the sweet potatoes a few times with a fork, and place on a baking sheet. Cook 45 minutes to 1 hour, or until they are cooked through and tender to the touch. Remove from the oven and allow to cool until they are cool enough to handle. Cut each potato in half lengthwise, and carefully scoop out the filling and add to a medium bowl. You don't want to scoop out all of it, since the skins are pretty thin, but aim to scoop out 90% or so. In a small skillet, melt the butter over medium heat, whisking constantly. When it reaches a deep golden-brown color and has dark brown specks in it, remove from heat immediately. In a small bowl, combine the breadcrumbs, 2 tablespoons of the butter, 2 teaspoons of the sage, 2 tablespoons of sage, and salt and pepper to taste. 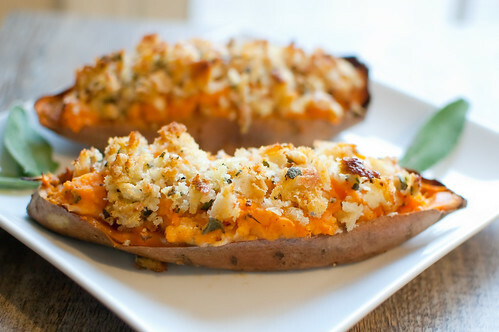 Using a fork, mash the sweet potato filling until it's smooth. Add the remaining brown butter, sage, Gruyere, the maple syrup, cayenne, and Greek yogurt. Mix well to combine. Divide the filling among the potato skins. Sprinkle the breadcrumb mixture over the potatoes. Return to the oven and cook about 15 minutes, or until the filling is heated through and the breadcrumbs are turning light golden-brown. Serve. These are beautiful, and full of things that I LOVE! anything with gruyere is delicious, but this combo sounds phenomenal! You had me at twice-baked. The bread crumbs, the brown butter, the sage, the gruyere; sounds so delicious! josie, these look awesome! 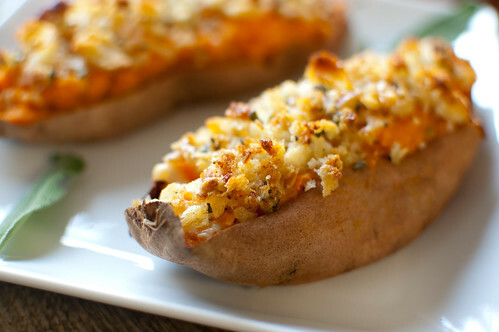 i love twice-baked potatoes but have never done them with sweet potatoes. i'm definitely going to give these a try :) happy thanksgiving!! These have perfect fall flavors. Yum! These look delicious! Love gruyere, and sage, and put it all together with sweet potatoes and it sounds just divine!! This looks so good! Much better than the traditional sweet casserole. Great recipe. These sound soooo freaking yummy! I set out to make these tonight, but the potato skins collapsed. Definitely need to heed your warning a little more! So, I turned the dish into mashed sweet potatoes. Still mixed in everything, topped it with the bread crumbs, and finished it in the oven. My family and I loved it. I especially appreciate a fresh take on the sweet potato. Thanks for a really excellent recipe! um, yum??? I have been looking for a not-as-sweet, yet still delicious way to serve sweet potatoes. . . . Looks fantastic! In the directions, there is a little typo about adding 2tsp of the sage, followed by 2T of the sage. Not sure if you meant to add something else then, or just double-typed the same ingredient. I want to make these today. Thanks! ..I'm basically dying over these.